We are pleased to announce three new displays available from FW Murphy from the New Year. the flash storage for the PV780B has doubled to 8GB. bonded LCD and rugged design make it a perfect solution for all types of environments and applications. 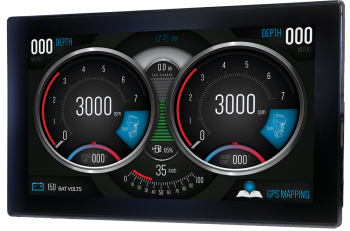 engine information, the PV1100 packs an infotainment hub in the cab with media playback from your phone via USB. It also boasts AM/FM stereo, Bluetooth and Wi-Fi connectivity. adds more connectivity with Bluetooth, Ethernet and Wi-Fi capabilities while it includes an expansive 8GB of storage. design make it a perfect solution for all types of environments and applications. custom parameters and specialized graphics for on-screen text, OEM branding and more.